Q. Tell us about yourself. What sparked the interest in you to become a pilot? I am Sameena Masood, currently working with Air India Express as a first officer. I was born in Leh and studied till 2nd grade in Moravian Mission School. At the age of 8, I was sent to boarding school and completed most of my education from Delhi. I pursued my graduation from Ramjas College, Delhi University after which got enrolled in Indira Gandhi Rashtriya Uran Akademi (IGRUA) for a flying career. I always fancied the life of a pilot but after joining IGRUA the passion to become one of it got higher. The sense of discipline and responsibility that is required for an individual to deliver the best way possible is something that I have learned during my training in IGRUA. Also, my family and friends who have never failed to show their constant support and encouragement. Q. Aviation being a male-dominated industry, was there any challenge you faced on your journey to becoming a pilot? India has a maximum number of female pilots as compared to other countries. And I think it is more of an individual’s capacity. I would not say that it is difficult for a woman to become a pilot because the training process is the same for everyone irrespective of gender. 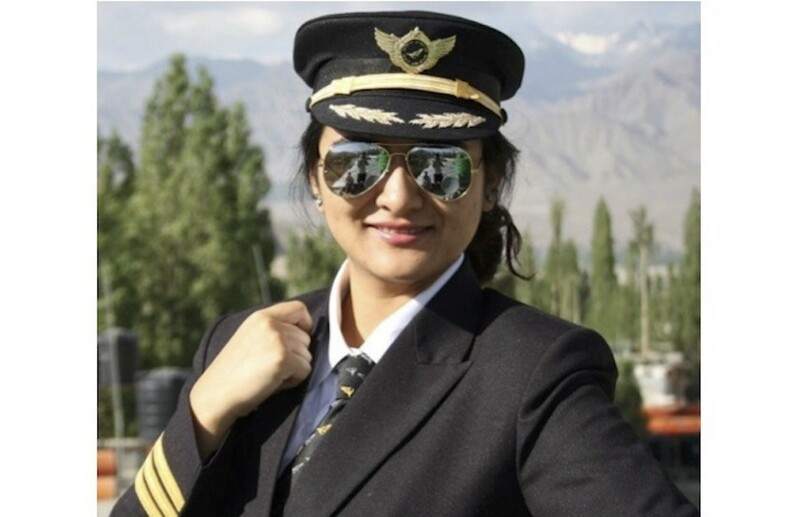 There is no difference in pay scale for a male or a female pilot and we are given equal opportunity to progress purely based on our experiences and performances. The idea of anything being difficult or easy, by virtue of your gender, most often than not, is instilled in us by the society we live in. I am fortunate to be brought up in a family where gender was never thought of as a barrier or a license for something. Q. Share us your experience when you first started flying. When I started flying I was an apprehensive and a nervous beginner but was blessed with the best of instructors who helped me to learn the skills better and become a confident professional. In every walk of our life, we will meet many who will discourage and discredit us. In a male-dominated society like ours, there will be at every step, someone questioning your ability to do your job well. Your work may not get fervent a cheer as that of a male counterpart. As a woman, we are made to feel that female achievement is not manifested in skills or hard work. There are times when your colleagues will doubt your abilities and you will stop believing in yourself for a while. But you should know that while you are self-doubting, there are many people who are intimidated by your potentials and capabilities. I think it is your failure that defines who you are rather than success. You should get back on your feet each time life knocks you down with challenges and fight the battle without fearing to win or lose. This at least will prove to yourself and the world your conviction and bravery that for accomplishing a dream you ought to take up the task to reach there, no matter the circumstances and outcome. Q. What attributes and qualities should women have or bring to walk and lead along with men? I think you have to fight your own battle with courage and respect by giving yourself all the needed love and care. When the whole world screams echoes of pessimism in your ears you should never strangle the motivated and positive inner desires. Always stay inspired and spirited. Be kind and always have a learning attitude. You might have to leave homes, cities, and countries to pursue greater ambitions. You might have to leave friends, lovers, and possibilities for a chance to roam around the world and make deeper connections. It will be scary at first but trust me, you will most definitely find love, adventure and freedom and more than anything else you will find your own self. Don’t get discouraged by your failures while pursuing your dreams just because it doesn’t fit into so-called “Approved” conventions of the society for a woman. Trust me there are many hooting for us, waiting for us to step up and break through the glass ceiling and most importantly, be grateful.